After several years of cooking gluten-free foods–not exclusively, but often–I have tested various flour combinations as a substitute for wheat flour in baking. I have also experimented with quite a number of substitutes for bread crumbs or panko. Oats, corn flakes, gluten-free bread, cornmeal and ground nuts–or a combination of these–have all gone through the unofficial Fountain Avenue Test kitchen. The one I like the best, would you believe, is Rice Chex! 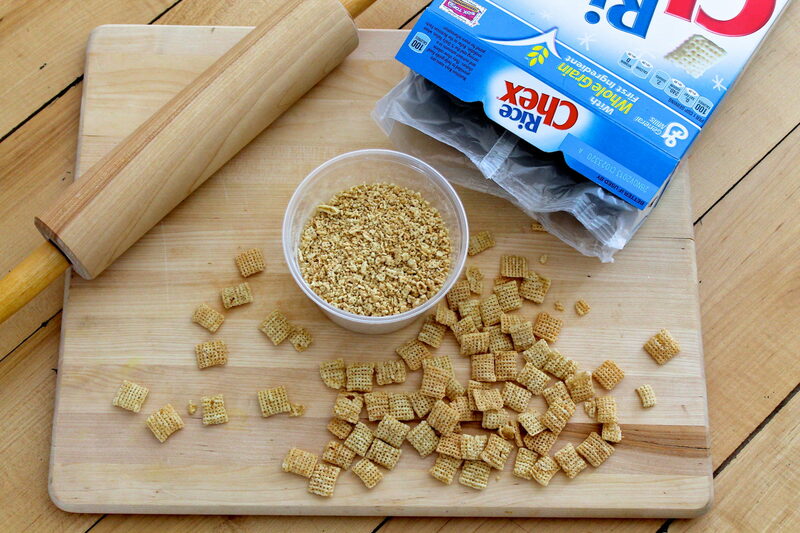 Three cups of Rice Chex will crush into approximately one cup of crumbs. I typically use my mini-processor to make quick work of the grinding, although a rolling pin and a zipper-top bag works well, too. Another great option to the zipper-top bag is the actual bag the cereal comes in. Although this may pose a problem with a full box of cereal, if you are getting towards the bottom of the box, this bag makes a sturdy vehicle in which to crush your crumbs. I have used crushed Rice Chex in place of the bread crumbs in foods like crab cakes and meatloaf (oats work well in these recipes, too), but where I really think they shine is as an exterior breading. My favorite recipe in which to use the crumbs this way is Roasted Asparagus with Panko. Dare I say I might like this dish better with the Rice Chex?! For my All Purpose Gluten-Free Flour Blend, which I use in almost all baking, click here. Duh, why didn’t I think of that! Thanks Ann, I’ve been racking my brain trying to come up with a cheaper solution to Gluten-Free bread crumbs which are expensive. I’ll give it a try when I make crab cakes the next time. Also can’t wait to try the asparagus recipe. Thanks for the comment, Deb, and I hope you find them to be as useful an option as I do. They provide good crispiness and, I think, have a little more texture than the panko! What a GREAT idea! Rice Chex are the only cereal myfather eats so I always have them on hand. Thank you so much for the tip. When a recipe calls for Panko, I use almond meal. I often use the almond meal with a bit of grated [dried in a can] Parmesan cheese. But if you are dairy-free, just the almond meal works great. My non-GF boys prefer the almond meal to Panko for Parmesan Chicken. Almond meal is a terrific option to panko. Thanks for the great suggestion, Jan…and don’t you love it when the kids like the healthier option better?! I want to say that when I am kicking myself for not even thinking of this. That is by far the coolest idea to stay gluten free without breaking the bank. Don’t you love it when there is such an easy fix? So glad you found it, Nika…I know you’ll enjoy! Yesterday I used your All Purpose Gluten-Free Flour Blend to make Lemon Squares. When I cut them to serve, the crust was crumbling. What do you think I did wrong, or what would you suggest I do differently to avoid making the same mistake again. The flavor was fine, but crumbling. This recipe I’ve used for the last 25 years and never had this problem. However, before I used the gluten All Purpose flours. In the past 2 years I’ve been baking with gluten free items. I’ve used other blended flours, only recently mixed up your recipe..
Hi Dorothy, I’ve used that blend in so many recipes with great success. From what you describe, it almost sounds like there was too much flour–that often leads to a dry or crumbly end result. Whatever the case, I’m very sorry it didn’t work out for you. As an aside, I started making that mix years ago, before there were good GF cup-for-cup mixes available. I always used Bob’s Red Mill products, and now they have their own GF blend with ingredients very similar to the one I always used. If you can think of any other factors that may have been different, or if you varied any of the ingredients in the mix, let me know and we can figure this out! Hi Mary, I use always use this in place of Panko and nobody ever knows the difference unless I tell them. Some think it yields a better result than panko! The trick its make the crumbs small enough that you don’t see lots of little Chex pieces without making it complete powder–you want a hint of texture to the crumbs. Wishing you a merry holiday season, too! Wonderful, Antonia. It works so well!